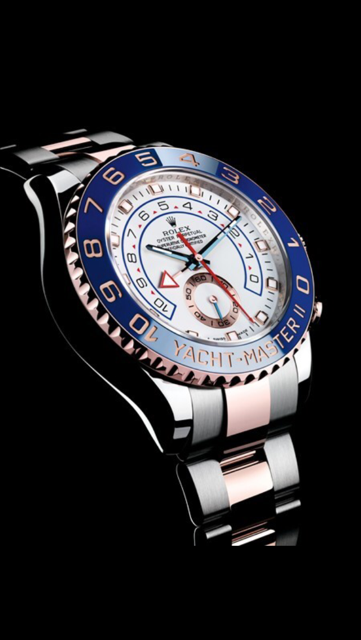 The Rolex Yacht-Master II is designed to meet the needs of professional sailors. This regatta chronograph features the world’s first programmable countdown with a mechanical memory. It provides precise synchronization with the crucial starting sequence of a yacht race. Oyster, 44 mm, 904L steel and 18 ct Everose gold. Rolex Ring Command (bidirectional 90° rotatable interacting with the movement) in 18 ct gold with blue Cerachrom insert in ceramic and numerals coated in gold. Screw-down, Triplock triple waterproofness system. Waterproof to 100 metres / 330 feet. Perpetual, mechanical, self-winding, regatta chronograph, 4161, Manufacture Rolex, -2/+2 sec/day, after casing. Approximately 72 hours power reserve. Everose Rolesor – combination of 904L steel and 18 ct Everose gold.